Space Exploration Technologies (SpaceX ) had a very busy day this Tuesday, Feb. 10 as the NewSpace firm attempted a satellite launch on the East coast of the U.S. while preparing to recover a Dragon capsule on the West coast. Due to high altitude winds the launch was postponed until Wednesday Feb. 11 – but the splashdown was on target. 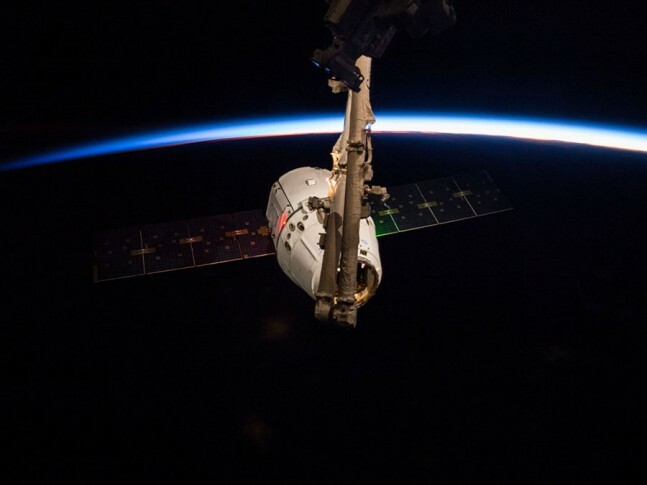 After departing from the International Space Station (ISS) earlier today, Dragon reentered the Earth’s atmosphere and splashed down approximately 260 miles (418 km) of the coast of California, southwest of Long Beach. 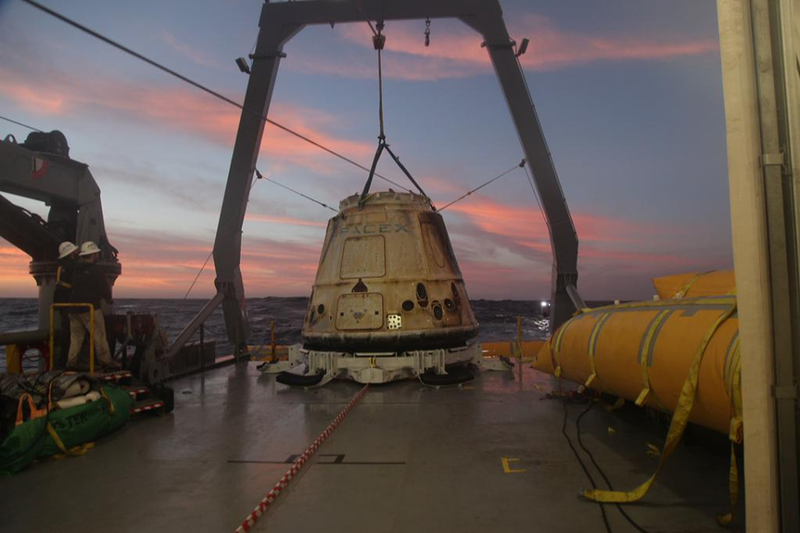 The capsule was en route to Long Beach where time sensitive cargo will be removed and shipped back to NASA. Dragon will then make a return trip by truck to McGregor, Texas, home of the SpaceX test facility, for processing. Currently the Dragon capsule is the only vehicle capable of returning significant amounts of payload from the ISS. The Dragon contained almost 3,700 pounds (1,678 kg) of NASA cargo experiments and one-of-a-kind samples of new technologies. Among the returned items are the first ever objects created using a 3D printer. These parts were created using a low temperature plastic to avoid any potential complications. Included in the samples is a small ratchet, created in a computer aided design program that had been uploaded to the station late last year. NASA will now test the samples and evaluate future use of 3D printing technology on the station. In addition to the 3D printed samples, the capsule returned samples from the Advanced Plant Experiments (03-1) and several biology and microbiology studies. Researches will now study the samples returned. In the case of the plant samples, they will analyze them to determine the molecular and genetic mechanisms that control plant development in a microgravity environment. Scientists may be able to to improve agriculture and bioenergy research here on Earth with the results of these studies. One of the experiments on board explored the production of high-quality crystals of the cystic fibrosis protein (and other related proteins). These crystals are difficult to grow on Earth so scientists attempt to grow them in space to learn more about their shape and structure. The Advancing Membrane Protein Crystallization by Using Microgravity investigation looks to improve drug therapies for cystic fibrosis, a genetic disorder that causes severe damage to the lungs and digestive system. 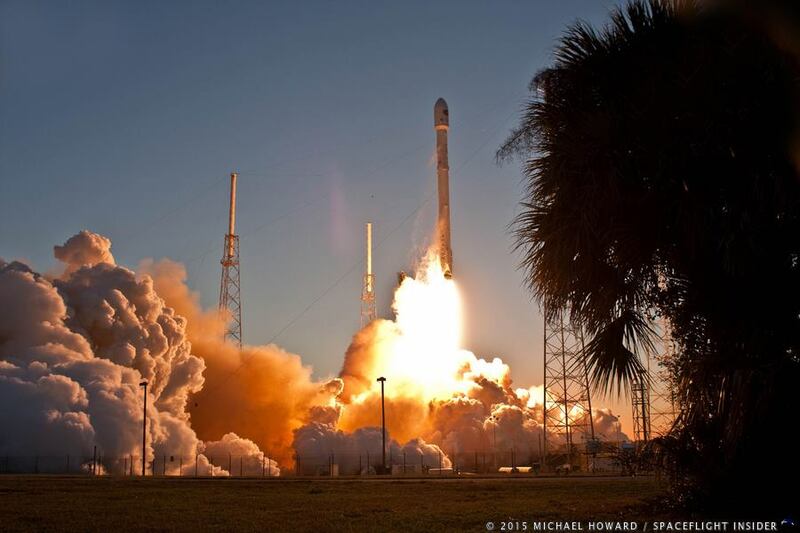 SpaceX launched this Dragon capsule from Cape Canaveral Air Force Station on Jan. 10. The fifth of twelve flights SpaceX has under contract with NASA, this Dragon carried over 5,000 pounds (2,267 kg) of supplies. It docked with the ISS two days later on January 12th. Included within the supplies were components for 256 different scientific investigations. Welcome home Dragon!!!! Dragon is the workhorse until Cygnus gets launched. A wise choice in having two supply vehicles. Now, if Congress doesn’t force NASA to down to one crew vehicle. Hope the President exercises his veto power to put the Repubs in their place, if necessary.